This sequence of images shows the movement of this 3D-printed ‘grabber’ being controlled by an external magnetic field. Photo: Felice Frankel. Engineers at Massachusetts Institute of Technology (MIT) have created soft, 3D-printed structures whose movements can be controlled with a wave of a magnet, much like marionettes without the strings. This menagerie of magnetically manipulated structures includes a smooth ring that wrinkles up, a long tube that squeezes shut, a sheet that folds itself, and a spider-like ‘grabber’ that can crawl, roll, jump and snap together fast enough to catch a passing ball. The spider can even be directed to wrap itself around a small pill and carry it across a table. The researchers fabricated each structure from a new type of 3D-printable ink infused with tiny magnetic particles. Using an electromagnet fitted around the nozzle of a 3D printer, they were able to induce the magnetic particles to swing into a single orientation as the ink was fed through the nozzle. Controlling the magnetic orientation of individual sections in the structure allowed the researchers to produce structures and devices that can almost instantaneously shift into intricate formations, and even move about, as the various sections respond to an external magnetic field. Xuanhe Zhao, a professor in MIT's Department of Mechanical Engineering and Department of Civil and Environmental Engineering, says the group's technique may be used to fabricate magnetically controlled biomedical devices. "We think in biomedicine this technique will find promising applications," Zhao says. "For example, we could put a structure around a blood vessel to control the pumping of blood, or use a magnet to guide a device through the GI tract to take images, extract tissue samples, clear a blockage or deliver certain drugs to a specific location. You can design, simulate and then just print to achieve various functions." Zhao and his colleagues report their results in a paper in Nature. His co-authors include Yoonho Kim, Hyunwoo Yuk and Ruike Zhao of MIT, and Shawn Chester of the New Jersey Institute of Technology. The team's magnetically activated structures fall under the general category of soft actuated devices – squishy, moldable materials that are designed to shape-shift or move about through a variety of mechanical means. For instance, hydrogel devices can swell in response to changes in temperature or pH; shape-memory polymers and liquid crystal elastomers can deform in response to stimuli such as heat or light; pneumatic and hydraulic devices can be actuated by pumping air or water into them; and dielectric elastomers stretch under electric voltages. But hydrogels, shape-memory polymers and liquid crystal elastomers are slow to respond, changing shape over the course of minutes to hours. Air- and water-driven devices require tubes that connect them to pumps, making them unsuitable for remotely controlled applications. Dielectric elastomers require high voltages, usually above 1000 volts. "There is no ideal candidate for a soft robot that can perform in an enclosed space like a human body, where you'd want to carry out certain tasks untethered," Kim says. "That's why we think there's great promise in this idea of magnetic actuation, because it is fast, forceful, body-benign and can be remotely controlled." Other groups have fabricated magnetically activated materials, though the movements they have achieved have been relatively simple. For the most part, researchers mix a polymer solution with magnetic beads and pour the mixture into a mold. Once the material cures, they apply a magnetic field to uniformly magnetize the beads, before removing the structure from the mold. "People have only made structures that elongate, shrink or bend," Yuk says. "The challenge is, how do you design a structure or robot that can perform much more complicated tasks?" 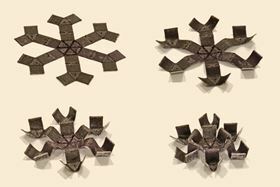 Instead of making structures with magnetic particles of the same, uniform orientation, the team looked for ways to create magnetic ‘domains’ – individual sections of a structure each with a distinct orientation of magnetic particles. When exposed to an external magnetic field, each section should move in a distinct way, depending on the direction its particles move in response to the magnetic field. The group surmised that this approach should produce structures able to carry out more complex articulations and movements. With their new 3D-printing platform, the researchers can print sections, or domains, of a structure, and tune the orientation of magnetic particles in a particular domain by changing the direction of the electromagnet encircling the printer's nozzle, as the domain is printed. The team also developed a physical model that predicts how a printed structure will deform under a magnetic field. Given the elasticity of the printed material, the pattern of domains in a structure and the way in which an external magnetic field is applied, the model can predict the way an overall structure will deform or move. Ruike found that the model's predictions closely matched the results of experiments the team carried out with a number of different printed structures. In addition to a rippling ring, a self-squeezing tube and a spider-like grabber, the team printed other complex structures, such as a set of ‘auxetic’ structures that rapidly shrink or expand along two directions. Zhao and his colleagues also printed a ring embedded with electrical circuits and red and green LED lights. Depending on the orientation of an external magnetic field, the ring deforms to light up either red or green, in a programmed manner. "We have developed a printing platform and a predictive model for others to use. People can design their own structures and domain patterns, validate them with the model, and print them to actuate various functions," Zhao says. "By programming complex information of structure, domain and magnetic field, one can even print intelligent machines such as robots."